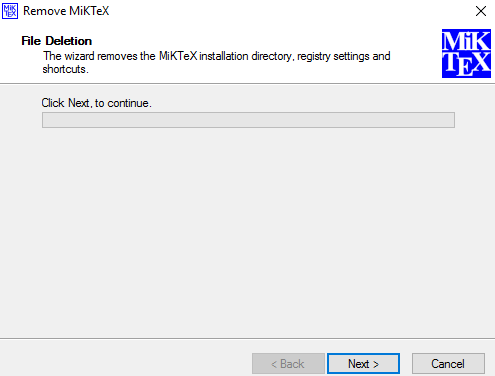 MikTeX program is still in Windows' Control Panel's Uninstall Program window. All the MikTeX utilities (Program Manager, TexWorks etc...) are still in the Start Menu of window and I can open and run them. Only thing I have noticed is that after running the Uninstall wizard below and rebooting the machine, the file association of .text file is gone but I can still run TexWorks and open a .tex file from there. The right pane of the TexWorks displays the Math equations correctly; but when I run the typeset button on the top left task bar of left pane I get the following error. log4cxx: No appender could be found for logger (pdflatex). 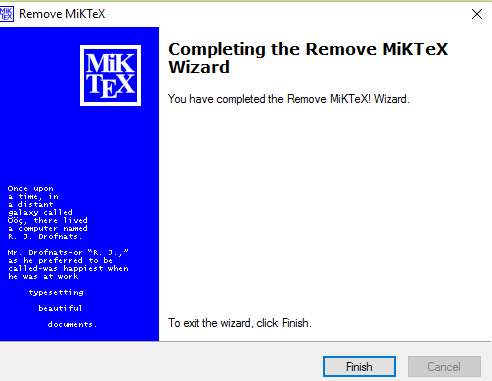 Sorry, but "C:\Program Files (x86)\MikTeX\miktex\bin\pdflatex.EXE" did not succeed. log4cxx: No appender could be found for logger (texify). 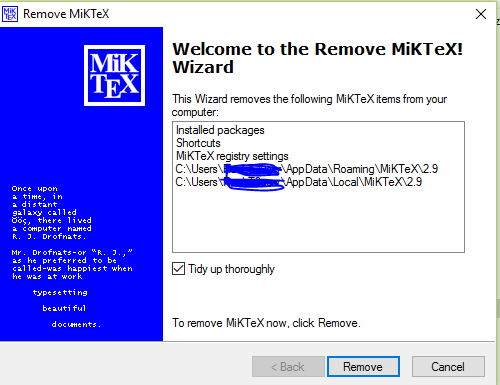 Sorry, but "C:\Program Files (x86)\MikTeX\miktex\bin\texify.exe" did not succeed. Browse other questions tagged miktex installing or ask your own question.